Conversion, extension, service and maintenance are part of our total range alongside the creation of complete systems for the conveying of bulk material and the integration of third-party products. Top-quality workmanship, reliable service and professional maintenance guarantee a long service life of the system. As a general contractor, we plan the conveyor system for your new plants or your plant expansions. We offer our support with the optimisation or conversion of your existing system. In addition, we manufacture complex customised systems at our factory in Rubigen. We manufacture and use components such as special conveyor belts, S-type conveyors with corrugated edge belts, slewing and bending devices, chain conveyors, sheet metal constructions and lots more. The purpose of a belt feeder is to withdraw the bulk material from a silo with a clearly defined flow and transfer it to the downstream conveyor system. The big bag is the ideal container for the handling of bulk materials. Our bucket elevators are used for the vertical and continuous transport of bulk material. A change-over flap is used for diverting bulk materials onto different paths. Our standard conveyor belts are equipped with a flat rubber belt and recessed stations. Corrugated edge conveyors are used once it is no longer possible to overcome the required gradient with a flat rubber belt. Dedusting systems make it possible to guarantee the legally required level of residual particles in clean gas. The filter housing is divided into a crude gas section and a clean gas section by means of perforated plates. 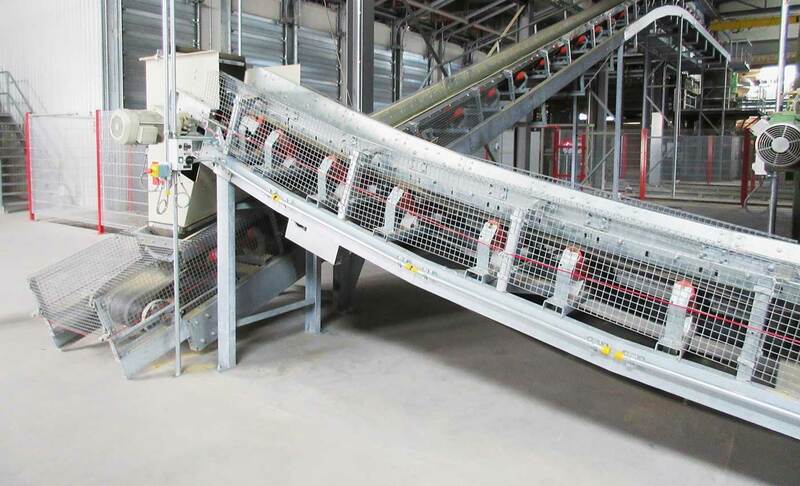 The purpose of a discharger conveyor is to withdraw the bulk material from a feeding hopper with a clearly defined flow and transfer it to the downstream conveyor system. The excavated material is fed by truck, dumper or wheel loader into the feed hopper and then siloed. Hand picking stations are fully equipped sorting cabins, which can be adapted to all customer needs. Magnetic separators are used for the separation of materials. Movable belt conveyors are used to eject the bulk material with a conveyor belt at multiple points. An old problem is solved with new technology. 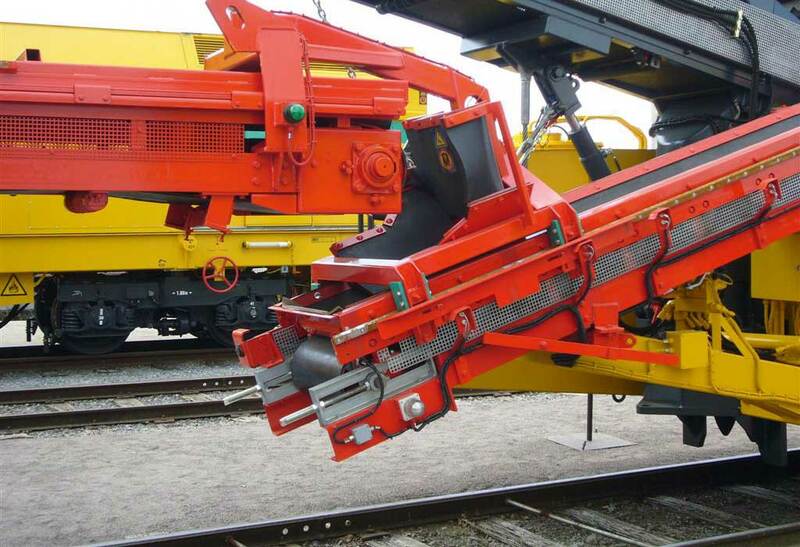 Solids industry – robots autonomously sort the various fractions such as metal, wood, stone, hard plastics and cardboard from mixed building waste and industrial waste. A screening machine is used to grade the bulk material according to desired particle sizes. Screw conveyors are continuous conveyors for all gradients. Switzerland-based SELFRAG is the first company in the world to use high-voltage pulse technology on an industrial level. We design and build the appropriate and required sheet metal constructions for you. A shredder is used to shred material. We design and build the appropriate and required steel constructions for you. The purpose of a trough chain conveyor is to transport heavily flowing or very dusty material in a closed system. Trough feeders are suitable for conveying and batch feeding of flowable bulk materials of almost any particle size. Weighing belts are used for the weighing of the bulk material at standstill or during ongoing operations. Windsifters are used to separate the material into coarse and fine material on the basis of their ratio of gravity and flow resistance. Customers appreciate our systems because they are user-friendly, robust and durable. This team gives you personal advice and support and helps you attain your goal without any detours. We are happy to take time to talk to you.